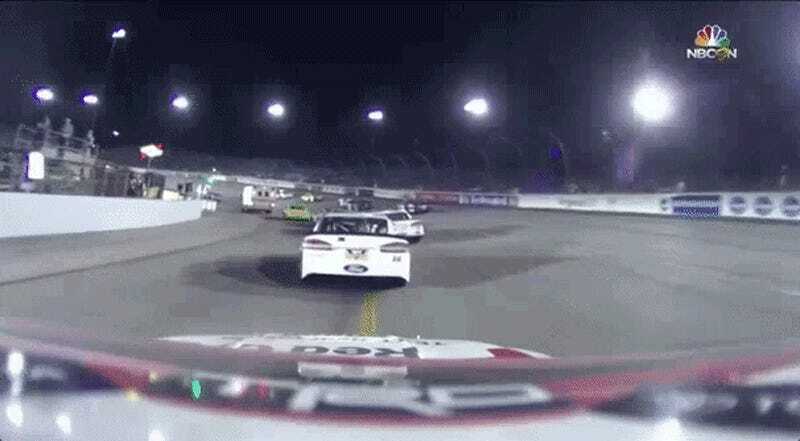 The NASCAR Cup Series just had a bizarre bottleneck heading into pit lane. A yellow flag came out after Austin Dillon spun out Danica Patrick, so everyone was flooding into the open pits. Problem is, there was an out of place ambulance in their way and the ensuing crash took a championship hopeful out of the race. Patrick lucked out and didn’t hit the wall, but she was plenty angry at Dillon for the incident, which happened on lap 255 of 400 of tonight’s race at Richmond International Raceway. Flagging has erred on the side of caution all night despite there being long periods of green-flag racing, so the flag came out after Patrick’s spin anyway. Unfortunately, an ambulance wasn’t listening to its onboard radio, according to NBC Sports’ commentary team. Competitors hoping to take advantage of the slow-down time to fit in a pit stop had the worst surprise of an ambulance parked right at the entrance to pit road. Cars jammed on their brakes and several made contact as a result. Worst of all, championship hopeful Matt Kenseth slammed into the rear end of the car ahead of him, forcing him to retire after his car’s radiator was damaged. Kenseth sits in 15th place and hasn’t had a win all season, so he’s really hoping that there are no new winners tonight that would push him out of the top 16. Tonight is the final race of NASCAR’s regular season before the top 16 drivers head into the playoffs. Clint Bowyer’s car was also significantly damaged as cars slammed on their brakes to avoid the ambulance, however, his team was able to get him back on track after some quick repairs. Fortunately, NASCAR didn’t penalize anyone who crossed over the pit lane entry line to get into the pits since it was their snafu. Still, Matt Kenseth will be absolutely on edge until the end of this race. 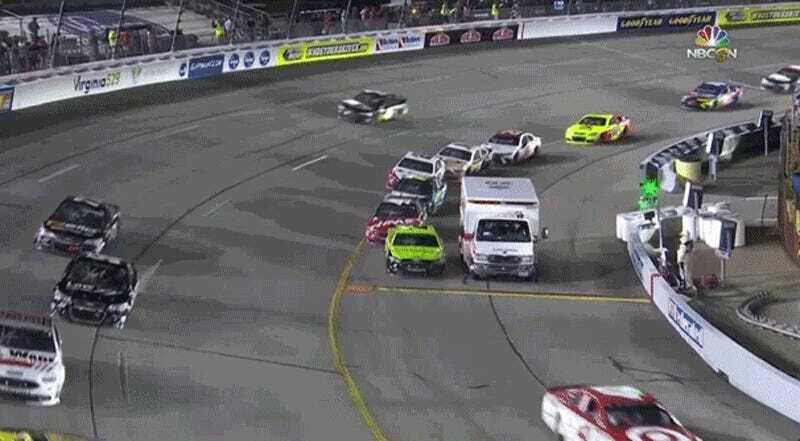 UPDATE [9/10]: NASCAR Senior Vice President of Competition Steve Miller confirmed that the ambulance just didn’t listen to what he was told over the radio to Racer, and also admitted that they probably should have closed pit road in response. ﻿We probably should [have closed pit road]. Those calls are very dynamic and they happen very, very quickly. It’s the race director in charge of pit road open and closed and it’s the track services and safety crew in charge of the other [directives]. We didn’t sync up tonight and we will make sure that we don’t let that happen again. Here’s how that went wrong. When we have our stage breaks they usually have three or four yellow-flag laps to control the field, and they opened up pit road way too soon there and there was an ambulance in the middle of pit road. It’s because these stages are confusing race calls. Maybe the driver thought this yellow flag would operate like one of the ones between each stage of the race. Regardless, when someone radios over and tells you to stop as you’re going out onto an active race track, you should probably stop. I’m just saying.